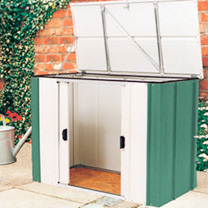 4' x 2' - Dimensions: EXTERNAL - 930mm height, 1300mm width, 660mm depth. DOOR OPENING - 560mm height, 830mm width. 6' x 3' - Dimensions: EXTERNAL - 920mm height, 1710mm width, 940mm depth, 1720mm height with lid open. INTERNAL - 890mm height, 1665mm width, 800mm depth. DOOR OPENING - 825mm height, 810mm width. FOOTPRINT - 1695mm width, 865mm depth.